When I mention Hermit the Dog, of course I’m talking about me. I’ve been guilty, at times, of being quite a recluse, (and I’m not talking about a bloodsucking spider). Be it as it may, I am quite outgoing when I choose to be. I am what I loathe to reveal to you, as a highly sensitive person. Anywho…I’m out of the coffin, trying to evade the sun. I’m reduced to a hooded version of myself which is ok for the coolness of the day, but not ok for this sun flexing on me like he on steroids. It’s whatever, I look fine for a guy who doesn’t care what people think. 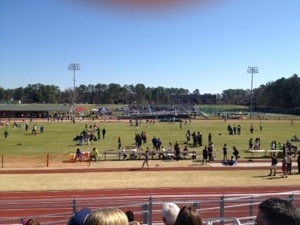 I’m at my sons first track meet and I hate track meets. They rarely stick to schedule – if your fortunate enough to even have a schedule that is. Then I’m waiting around having young pups remind me of how old I am; doing feats that, in my mind, I can do much better. Continuously comparing my glorious youth with that of mere mortals. On top of all that, they purposely make him run dead last so I have to sit here through the entire torture. Good thing I brought my handy dandy ________ . If you said NOTEBOOK and you were wondering whether you were a yungyin or an ol’ koot. Wonder no more, your a koot. I was GOING to say iPhone, DUH, hence the post….Lanardo. (You’ll hear me say that word a lot more in the future). Anywho, I’m sitting here about to combust and that’s hard for a black guy considering I’m already singed. It’s about that time. Thank goodness because I’m done. I mean either flip me over or take me out of here. Warning I’m hot. Although you might agree with my superior physical grandeur, that’s not what I mean. I mean that I’m uncomfortably heated. Not mad, but starting to swear sweat profusely. I severely misjudged the weather and now I must lie in this bed I made. Ugh. It’s time, I’ll talk to you when I make it back to my cave. Hermit the Dog signing out – sorry about the drool. About me…hmmmm. What’s to tell? I wear a hat of many colors. I’ll try to sum me up with the following: I am someone’s son, and another’s dad; filling a role in which I never had. Some call me student and other’s call me coach. Some call me: easy-to-talk-to and others call me: hard-to-approach. A few call me brother, although I’m a bit torn; cause I have many brothers, soldiers called Airborne. Some call me friend and all others will hate; my wife calls me Cholo, so no more dates. (Cholo is Spanish for country boy). I’m a husband, a father, and a self proclaimed sage; I’ve even been called dog, but I stay in my cage. Some call me loser, and some call me winner. But there is one thing you’ll never call me and that’s late for dinner. I found your blog, read it quickly, and wished for more. As a veteran of too many bleacher hours watching my grandchildren run, tackle, kick, cheer, whine, swim, shoot, catch, try, fail, miss, lose, win, I’m glad we’re about at the end of such fun;I related to Hermit the Dog goes Tracking. Write more. I’m ready. Thanks, I deliver like a mailman with a hot date on a Friday night. your sites rreally nice,keep it up! I’ll go ahsad and bookmark your site to come back down the road. I appreciate the honesty. Any suggestions? Love – A hero’s act.